When we talk about social media marketing, most of us think about campaigns targeting consumers and brand followers. Meanwhile, there is a lot to be said for marketing campaigns involving a company’s employees. There are two parts to effective employee advocacy. The first step is to embrace the use of social media in the workplace. The second one is knowing how to activate your employees and turn them into brand ambassadors. While many brands are skillfully employing social media for marketing purposes, the use of social media within a company is still often frowned upon and sometimes even banned. When managers hear “social media in the workplace” many of them are having nightmares of employees dicking around on Facebook instead of working, tweeting inappropriate memes, or spewing terrible things about their employer on their private social media accounts. But instead of contemplating how they can stop employees from using social media at work, companies should rather consider how they can channel social media for something good. 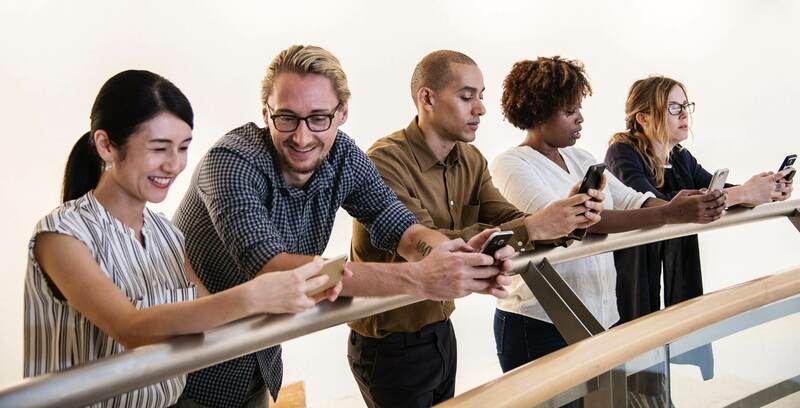 Smart companies know that their employees are on social media anyway and have developed strategies to harness their power accordingly. Turn your employees into your greatest brand advocates! Create a social wall for your office and activate your biggest brand evangelists. Employee advocates are employees who will actively promote your company or brand to the outside world, connecting with people you as a company may not be able to reach with your own communication efforts. These days, a large part of this sort of advocating happens online, on social media. Just like consumers trust other consumers and user-generated content, they will also put more trust in employees speaking well about a company rather than the company tooting its own horn. Your employees can become your biggest fans and brand evangelists! DO have a good company culture: if your company culture is bad, you won’t want employees sharing that. DO encourage social media use and sharing. DON’T make posting about the company on social media compulsory. I’ve heard of companies who more or less forced employees to get Twitter accounts and post regularly about the company. That’s not how you do it. DO show employees what kind of posts you would enjoy seeing by briefing managers and letting them set good examples. DO make employee advocacy fun and give something back, for example, by organising competitions, raffles, etc. Internal hashtag campaigns are a fantastic tool for employee advocacy, especially when combined with a social media wall, which offers a great way to display and draw attention to all those awesome posts. In principle, employee hashtag campaigns work just like any other hashtag campaign. The basic idea is to get people — in this case, employees — to share posts using a certain hashtag. You can then use the hashtag to populate your social wall and display the posts online, at an event or even on a screen at the company office. 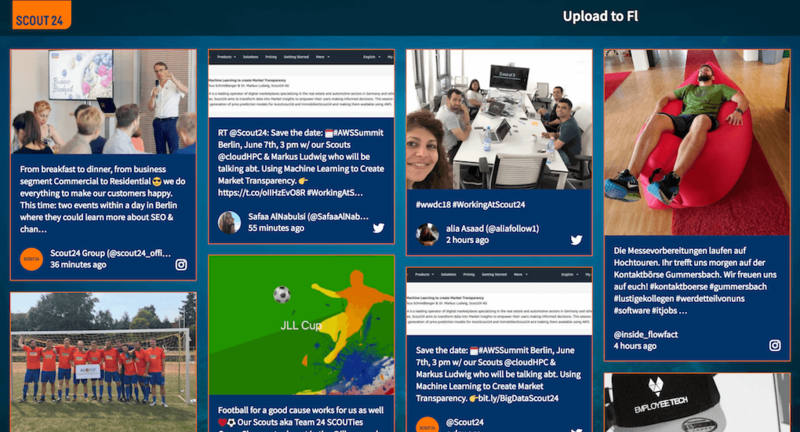 The social wall shows everything in one place which makes it easier to drive employee advocacy. The way you use your hashtag is totally up to you, as there are so many options. For example, you can create a hashtag campaign to show appreciation for your employees, as a way to show pride in what people do or to create a sense of community. Check out our examples, taken from real employee hashtag campaigns Walls.io customers have created in the past. Incentives are a great help for making a hashtag campaign work. Get creative and offer your employees actual rewards like extra days off, office upgrades, etc. or, at the very least, fame and glory within the company. A while ago, METRO Cash & Carry created a hashtag campaign involving both employees and customers. The campaign came in two phases. The first one activated employees in 25 countries, encouraging them to post selfies on internal channels. In the second phase, METRO customers were encouraged to post selfies, which were shown on a social media wall. METRO offered incentives and rewards to both employees and customers, making it more likely that people would take part. Find out more about METRO’s employee and customer hashtag campaign! Many universities like to use hashtag campaigns and Walls.io to create a sense of community for their students, alumni and staff. The social walls get displayed in a public place, giving everyone a great view of what everyone else is posting. Case Western Reserve University uses the social wall and various hashtags to bring together content from multiple university departments, students, alumni and staff. The wall is displayed on a gigantic screen at a central building at the university. The social wall keeps people informed but it also helps everyone feel that they’re being a part of something bigger. University of Michigan, on the other hand, starts working on creating a community even before students start their time at the university by asking them to post their Signing Day selfies using a certain hashtag. Check out the showcases for Case Western Reserve University and University of Michigan’s hashtag campaigns! Cisco used hashtags and Walls.io to connect more than 8,000 of the company’s employees in 22 locations and 7 time zones. The hashtags and social wall were used in conjunction with a global leadership event that also included a time zone-spanning video conference. Find out about Cisco’s global Cisco Leader Day event! IKEA Germany is asking trainees to share stories and photos from their trainee life at IKEA and tag it with a hashtag. The posts all go on a social wall which is embedded on IKEA Germany’s recruiting page. Meanwhile, digital marketplace Scout24 links to its social wall in job postings to give applicants an idea of what they can expect when they apply for a job with the company. Linking to the social wall where employees post about their life at the company is a great way to show off the company culture to potential applicants. Check out IKEA’s trainee recruiting website and how IKEA and others are using social media for recruiting! A while back we featured a showcase introducing the #BeTheWhy hashtag campaign. #BeTheWhy had employees of the YMCA of Greater Toronto talking about what they love about their jobs on social media. The campaign’s goal was not just to engage employees and make them feel like they are a part of something bigger, but also to raise awareness for the organisation and what it does for the wider community. Find out more by reading our #BeTheWhy showcase! Create a brand social wall to use both publicly and internally. Set it up in your lobby so everyone can see the awesome things your employees are saying about the company. Design a hashtag campaign to create awareness for what your company does. Set up internal competitions for employee perks to get people invested. If you’re in a big, global company or a distributed team create a hashtag that aggregates conversation and put it on a social wall. This will give people a way to get to know each other online despite great distances and create a sense of community. Use a social wall and hashtag to document and celebrate important days and add a little something to events, parties, etc. by setting up a screen that shows the social wall. Use your social wall as a job board or to show off your company culture to potential applicants. Create a social wall of fame where you announce and celebrate professional achievements, promotions, etc. Bring social media into your workplace!